The Honduran had taken incredible risks to reach the promise of liberty on U.S. soil — traveling 1,700 miles from his homeland by riding illegally on the network of freight trains that Central Americans call “The Beast,” where desperate refugees fleeing relentless violence and poverty are prey for criminals and prone to gruesome injuries. Now, as the man who would only identify himself to a journalist for BuzzFeed News as “M. Gonzalez” relates a situation that brings new meaning to the term "huddled masses, as he shivers behind barbed wire in the grim shadow of an El Paso overpass with hundreds of others, he realizes it was all a mistake. “It’s hell there. The bridge is one of the worst things I’ve ever experienced,” Gonzalez told BuzzFeed reporter Adolfo Flores. He described how what was supposed to be a few hours in temporary U.S. detention at America’s border with Mexico turned into days of agony, dodging pigeon droppings from the international bridge and sleeping on gravel with only a plastic cover to shield him from the frigid nighttime desert winds. This bizarre holding pen is a uniquely American invention — the temporary concentration camp. The U.S. Border Patrol, which created the site, insists that it’s run out of any other option to deal with a spring crush of asylum seekers at the southern border. And the refugees crowded under the bridge are getting clean portable toilets, regular meals and other amenities, and a tent that unfortunately isn’t nearly big enough to accommodate the throng. Migrants are gathered inside the fence of a makeshift detention center in El Paso, Texas, on Wednesday. And yet the inhumanity of so many desperate people penned up for public display like some kind of zoo animals is still shocking to see. And it begs several important questions. While they are clearly understaffed and overwhelmed, are U.S. immigration officials even trying to come up with a better temporary fix than human beings sleeping on ice-cold gravel? 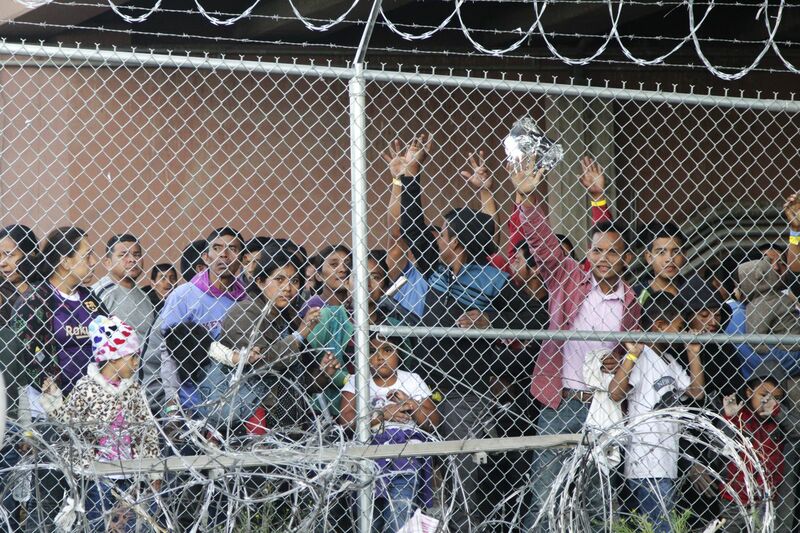 More importantly, why are these detainees and their suffering on such open display, so easily accessible not just to journalists but to everyday passersby — including some who, according to BuzzFeed, shout “Go back to your country!” or “You’re not welcomed!” from up on the bridge? Simply put, is this appalling display of American cruelty a bug, or is it a feature of Trump administration policy? President Trump seemed to replace that question mark with an exclamation point this weekend with two stunning pronouncements that — whatever his stated intentions — would have the real-world impact of amping up what many already see as a humanitarian crisis on the U.S.-Mexico border by several orders of magnitude. The first — Trump’s declaration that he will completely close off the border as early as this week unless Mexico stops what has so far in 2019 been an increase in Central American asylum seekers — is an idle threat … for now. Were the president to follow through on his gambit, the halt in trade would have a crippling effect on our own economy — a gigantic self-own. Last fall, a temporary shutdown at just one border crossing near San Diego for a few hours cost an estimated $5.3 million; a systemwide shutdown could cost more than $1 billion daily in lost trade and workers blocked from their daily commute. The Trump administration routinely cuts off its nose to spite its face and “own the libs” (remember the tariffs? ), but this deep slice would be taking away some last remaining brain matter along with it. The second threat, however, seems both more real and, thus, more insidious. Trump’s State Department announced on Saturday that it’s ending support for programs in Honduras, El Salvador, and Guatemala that had been expected to cost at least $500 million. Most of the money would have been funneled to nongovernmental agencies that are working to reduce the high rates of poverty and violence that are causing so many people to flee their native countries in the first place. It’s clear Trump doesn’t see it that way, although it’s likely he has zero idea what these programs do or what the basic concept is. "We were paying them tremendous amounts of money, and we’re not paying them anymore because they haven’t done a thing for us,” he told reporters, implying — incorrectly — the money goes directly to the governments of the three nations. Those who actually do know how the program works point out the obvious, that ending aid will probably make violence and deprivation even worse in Honduras, Guatemala and El Salvador, which means we’ll be seeing even more of their citizens making the dangerous trek north — certainly by next spring. It will increase the very thing that Trump claims he’s trying to stop. “The key is to get to them before” they leave for the United States, Ken Baker, leader of a U.S.-funded NGO in El Salvador, told the Washington Post. “When you’re talking about the problem at the border in the U.S., it’s already too late.” Last year, I wrote — and many others made a similar point — that improving life in Central America is both the best way to stop the refugee crisis and the most moral. That’s especially true when one considers that decades of bad American meddling in the region have made political violence and drug crime worse. But a common sense and arguably much more cost-effective way seems the farthest thing from the president’s mind. Trump’s brand is crisis — a notion he cemented on Inauguration Day when he elected to speak not on hopes or dreams but on “American carnage.” His fevered rallies, where diatribes against the “invaders” (the same term that just animated a mass murderer in New Zealand) are met with chants of “Build the wall!," reinforce that. And nothing aids the president’s goal of portraying himself as a defender against invading hordes than images of large crowds of asylum seekers like the images we’re seeing right now out of El Paso. The humanitarian crisis at the southern border is real — but the human rights violations are the ones that the United States government is either exacerbating or flat-out creating. Indeed, the budget bill passed by Congress this winter aimed to spend money on upgrading government detention facilities and increasing the number of now-overloaded immigration judges to process the asylum claims of refugees more quickly. But Team Trump seems much more interested in cannibalizing our military to pay for his grandiose border wall. The immediate effects of these policies is an affront to America’s basic human decency as a nation. For beginners, the Trump administration seems determined to find new ways to increase the cruel separation of children from the parents — maybe as a deterrent, maybe because it just doesn’t care to find better options. I’m old enough to remember when presidents ran for reelection on creating jobs, not on creating chaos. But Trump is rewriting our political playbook in the blood and misery of authoritarianism. The crisis of Central American migration is a complicated issue, but you don’t need a Ph.D in international relations to see that the American president is hell-bent on making things worse. And the road to this hellscape starts under a bridge in El Paso.